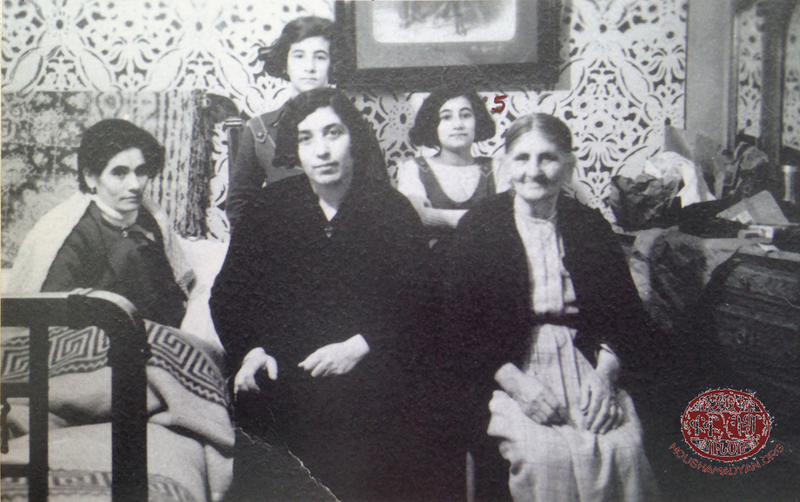 Buenos Aires, three generations of Arslanian/Belorian women, from Hadjin. These materials were collected during a Houshamadyan event in Buenos Aires in March 2016. These are from Marina Piranian’s collection and include various photographs, mementos and documents. 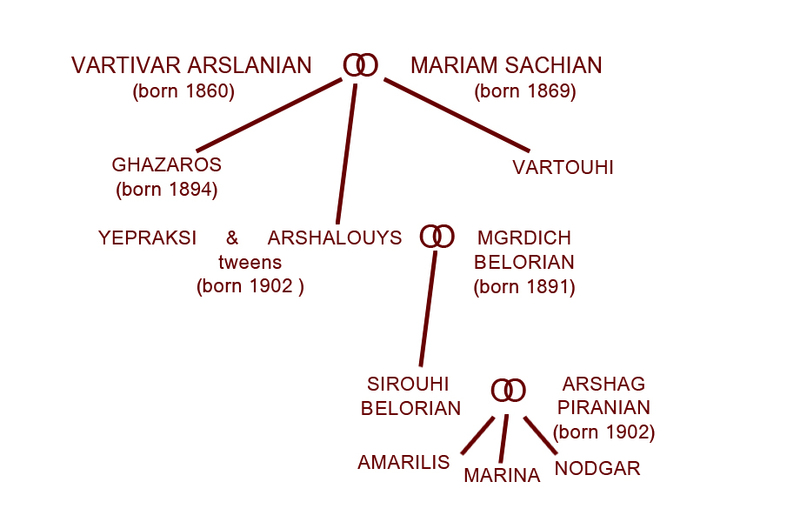 Marina’s maternal family is from Hadjin; her grandmother was Arshalouys Belorian (born Arslanian) and her grandfather Mgrdich Belorian. Mgrdich Belorian was born is 1890. He had immigrated from Hadjin to Argentina as early as 1912. 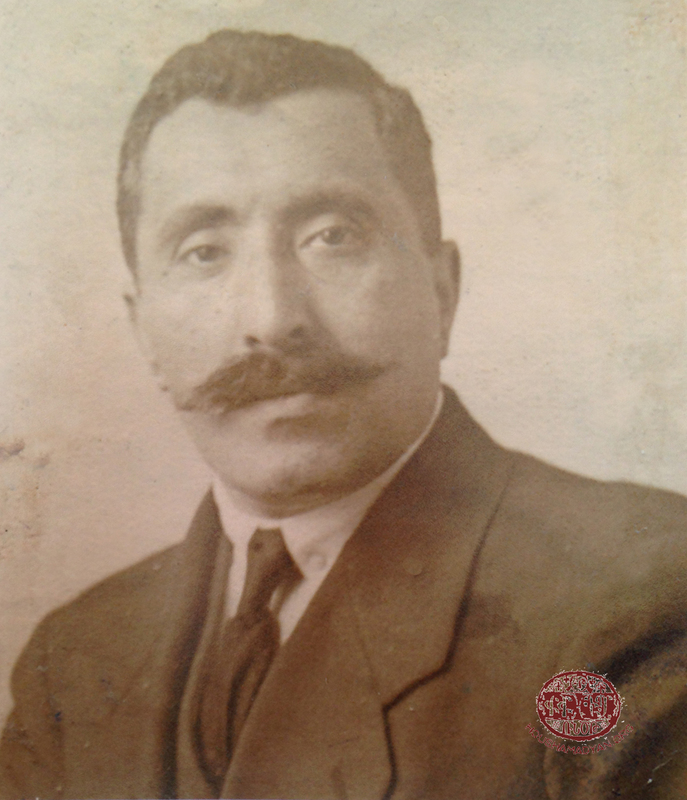 In 1915, he returned to Hadjin hoping to marry an Armenian from his native town. Not succeeding in finding a wife, Mgrdich returned to Argentina right before the Genocide. In 1919, he went to Hadjin once again, and this time, he met Arshalouys, and they married in Adana in 1921. Armenians from Cilicia were exiled again towards the end of 1921, this is when Mgrdich and Arshalouys first settled in Athens, Greece. 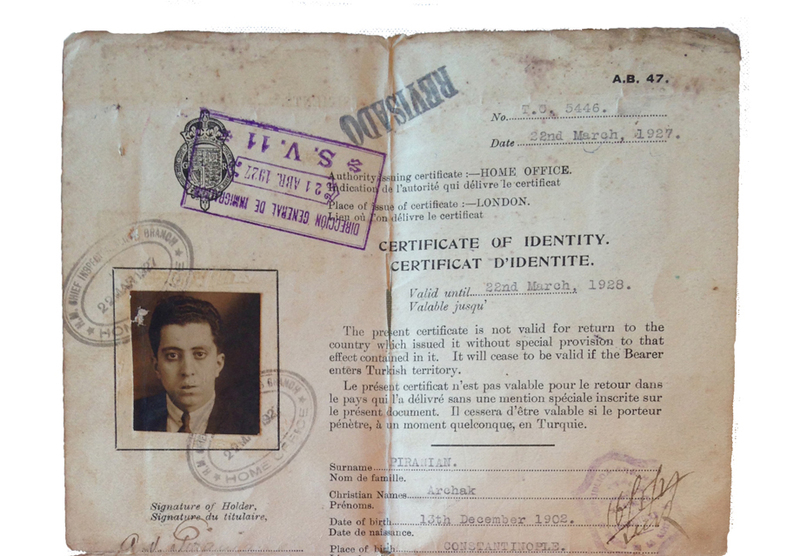 Their first child, Sirouhi, was born in Athens in 1922. Later, the family immigrated to Buenos Aires, where their other children, Jorge and Raquel were born. Sirouhi studied law and graduated in 1949 becoming the first female Armenian lawyer in Argentina. Marina’s paternal side of the family is from Istanbul. Her father was Arshag Piranian, her grandmother Nartouhi Piranian (Der Mikayelian), who was born in Arapgir and lived in Istanbul. After the 1895 Armenian massacres, Nartouhi’s family settled in Istanbul, her mother’s name was Elmas (1841-1905) and her father’s name Minas (1838-1915). The Piranians left Istanbul after WWI. Before settling down in Buenos Aires, Archag lived in and passed through Lebanon and Western Europe. 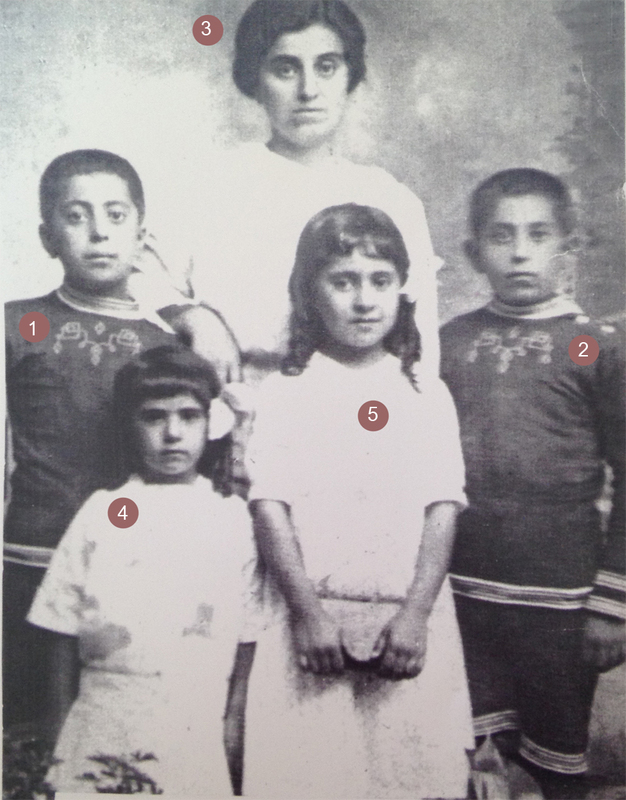 We see three generations of women from Hajin in the above photo, they all settled in Buenos Aires in 1934. 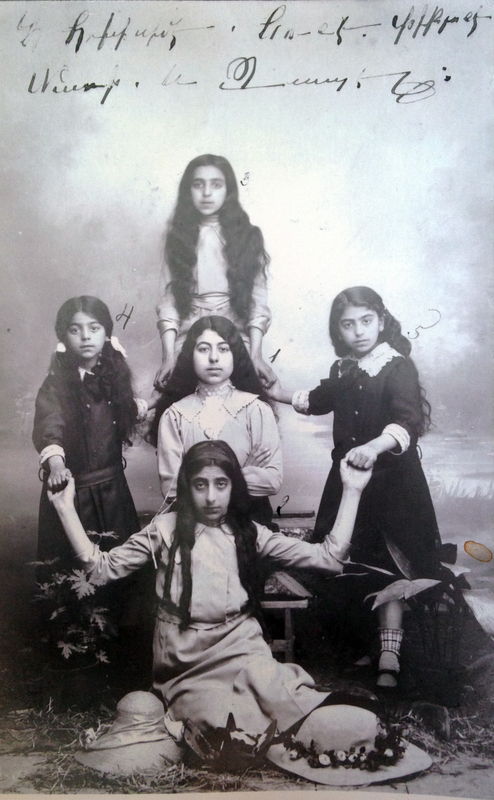 First row from left to right are: Arshalouys Arslanian (born Belorian, in 1902, sitting on the bed), Maria Arslanian (born Keklikian) and Mariam Arslanian (born Sachian, 1869). 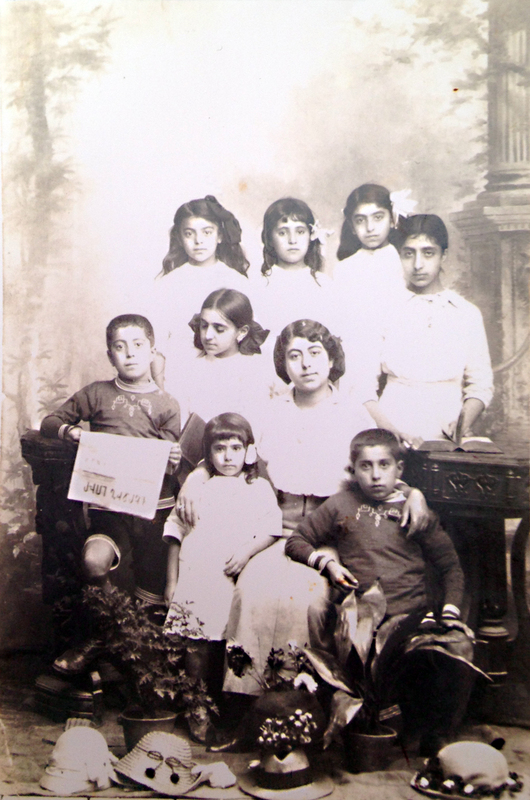 Back row, standing from left to right are: Sirouhi Belorian (later Piranian) and Rachel Belorian. 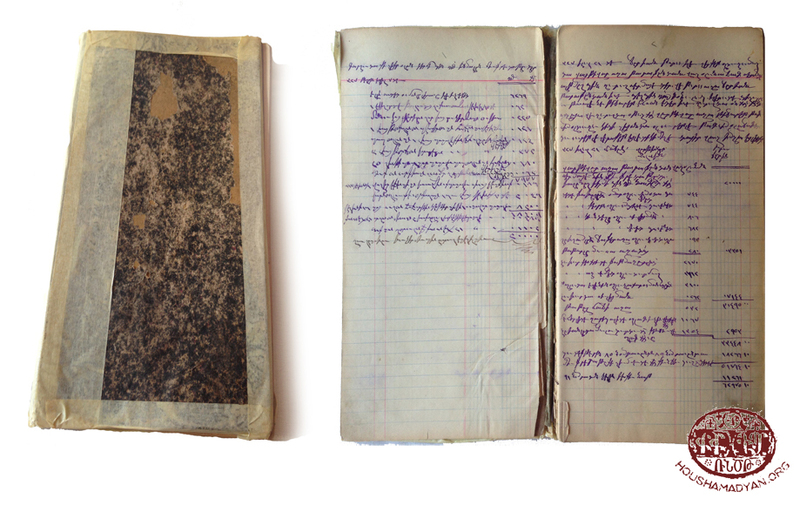 A book of accounts from Hadjin, which belonged to Vartivar Arslanian (Marina Piranian’s maternal great-grandfather). The family owned lands and farms and also bred livestock. This book of accounts of around 100 pages is written in Turkish using the Armenian letters, in it we can find business transactions, monetary accounts, names, etc. Arshalouys Arslanian and Mgrdich Belorian’s wedding invitation. They were both originally from Hadjin, but lived in Adana in 1921. Arshalouys and Mgrdich were both survivors of the Genocide. They endured the horrors of exile and like many other survivors, they returned to Cilicia at the end of the war, which was under French rule at the time. Their wedding took place on the 3rd of March 1921 in Adana. A short period after their wedding, the Armenians of Cilicia were forced to emigrate again, this is when Arshalouys and Mgrdich headed to Argentina. A copper bowl, Hadjin. This was a wedding gift to Ghazaros Arslanian, who was born in Hadjin in 1894. He went to Argentina in 1924. The bowl is currently in the possession of a family member in Buenos Aires. 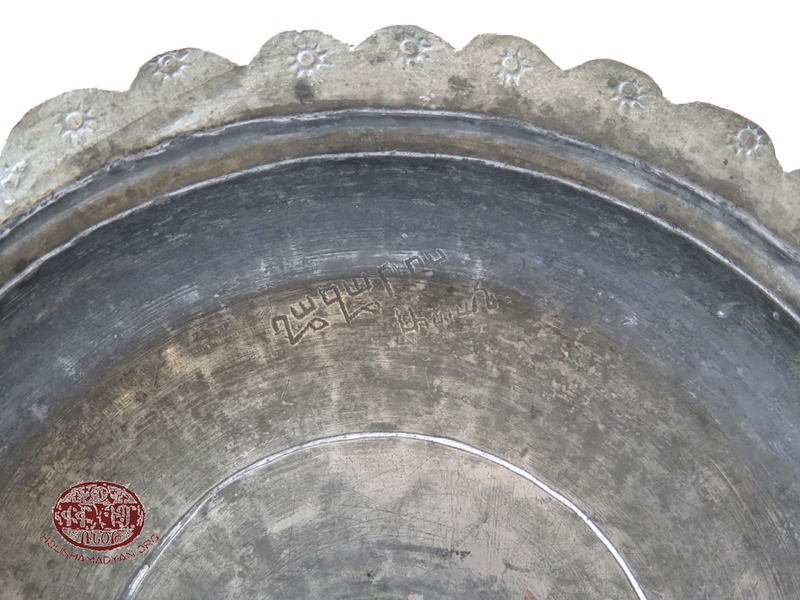 A detail from the copper bowl shown above, the name “Ghazaros Aslan” is carved on the bowl in Armenian letters. Property ownership document. It concerns a shop in Hadjin. The shop’s exact location is mentioned in the document. This belongs to Vartivar Arslanian’s collection of documents concerning the family properties. 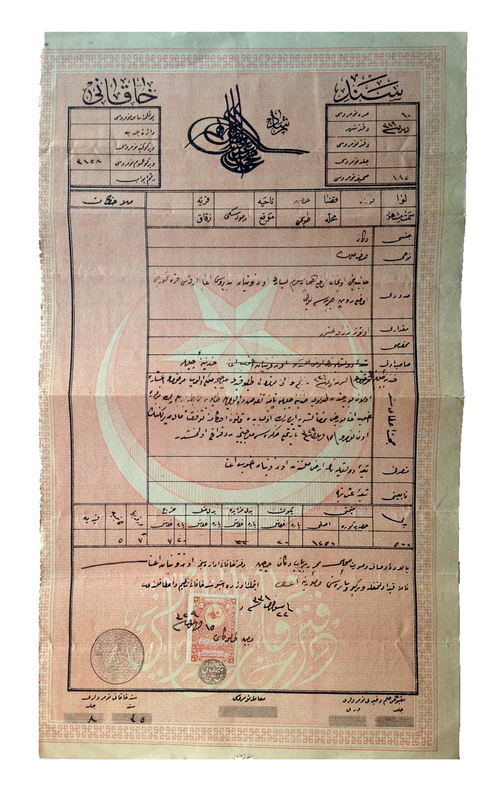 The above-mentioned property document in its totality. Istanbul, Üsküdar neighborhood, 1914. 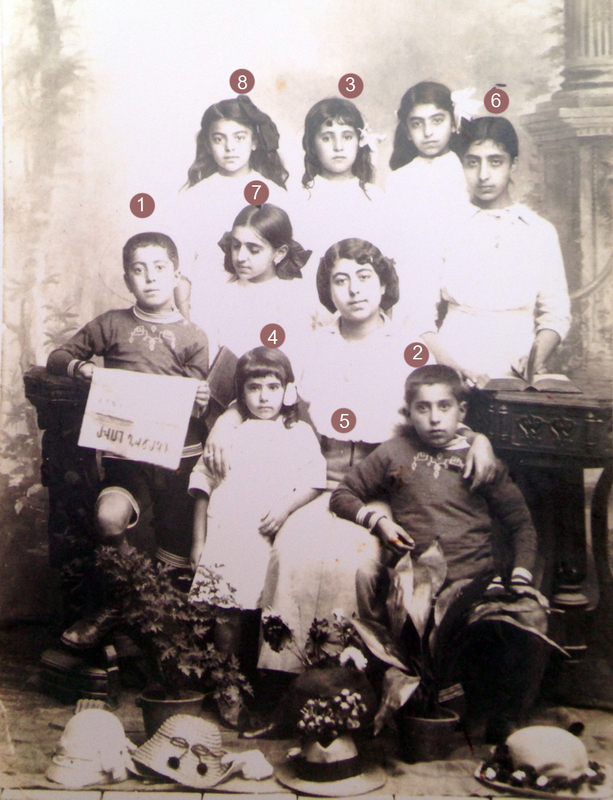 The Piranian family (sisters, brothers, cousins), the identities of the people in the photograph are listed in the column on the left. 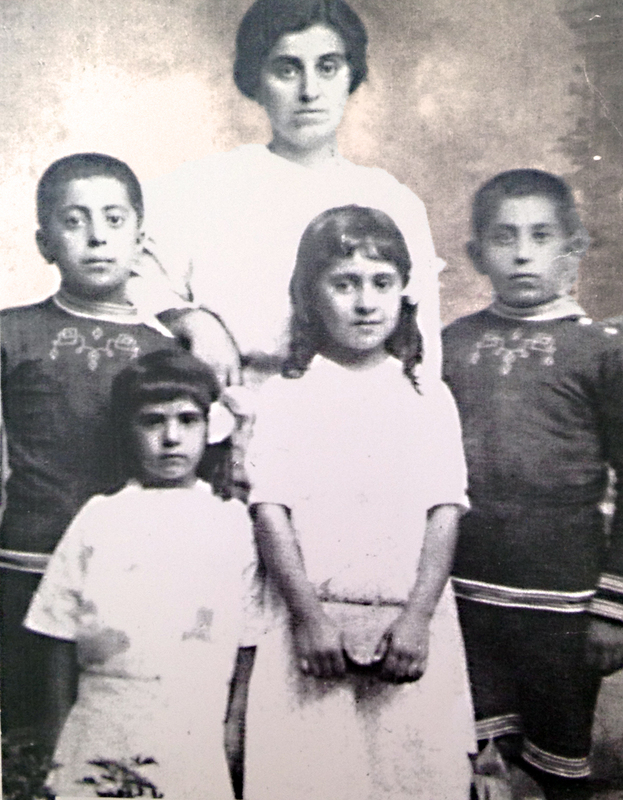 Hripsime, Noune, Peprone, Mary and Zabel from the Piranian family; the photograph was probably taken in Istanbul. Istanbul, 1914. The Piranian family (mother and her two children). The identities of the people in the photograph are detailed in the left column. 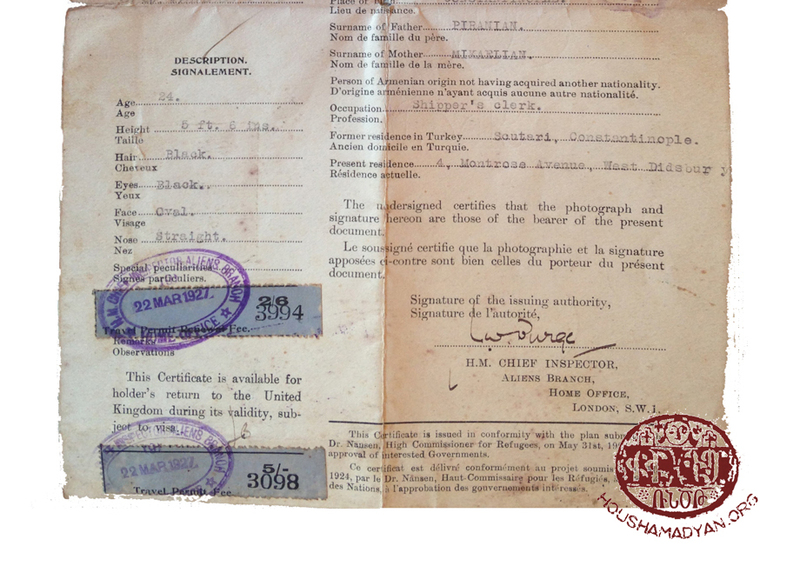 Archag Piranian’s British passport from 1927. Archag was born in Istanbul in 1902. He lived in Manchester in the 1920’s where he was a businessman. 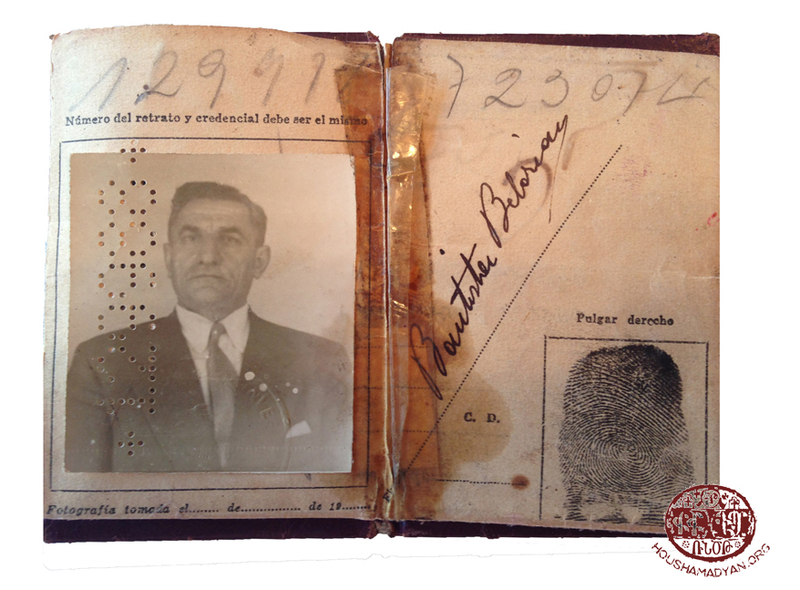 Arshalouys Belorian’s (born Arslanian) Argentinian passport from 1929. 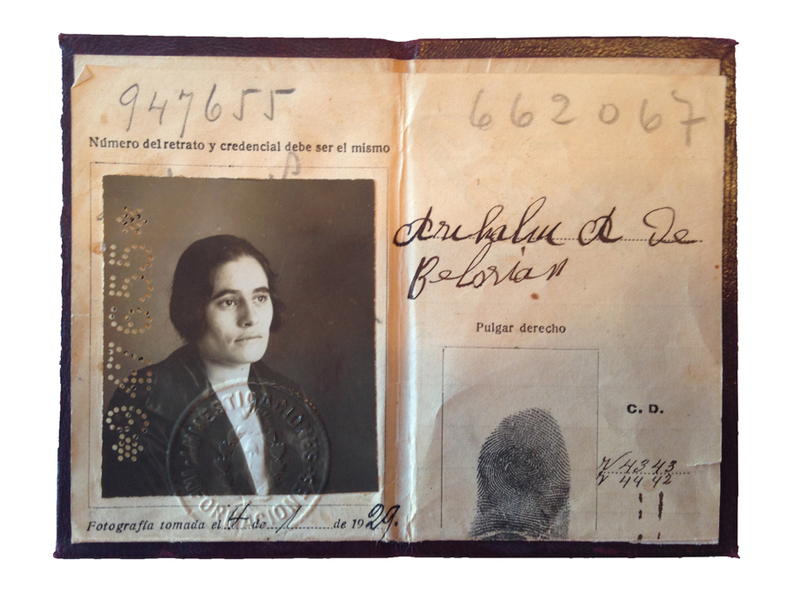 Mgrdich Belorian’s (born in Hadjin in 1891) Argentinian passport. 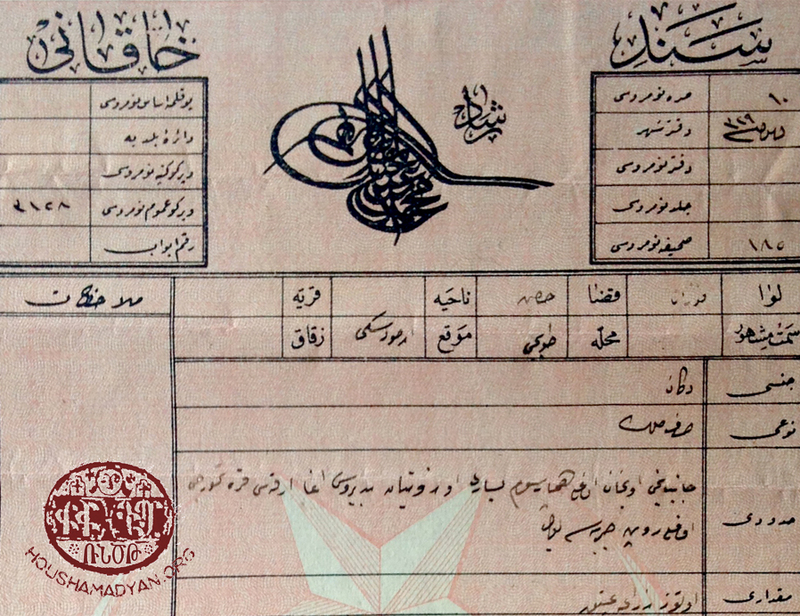 A property ownership document in Ottoman (Osmanlıca) from around 1911. The document concerns Vartivar Arslanian agha’s (as mentioned in the document) properties, their exact location and other nearby properties. 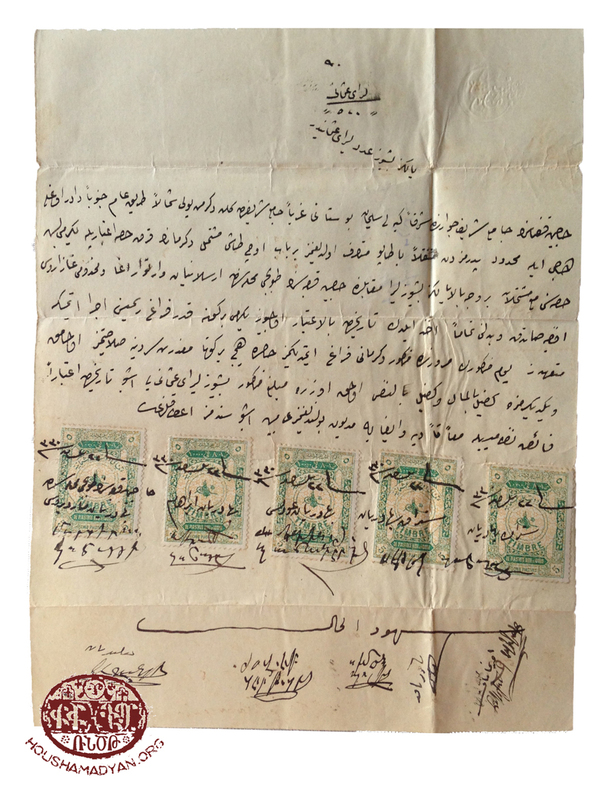 The receipt of a payment made by Vartivar Arslanian, Hadjin, around 1906. A business transaction receipt bearing Vartivar Arslanian’s signature. 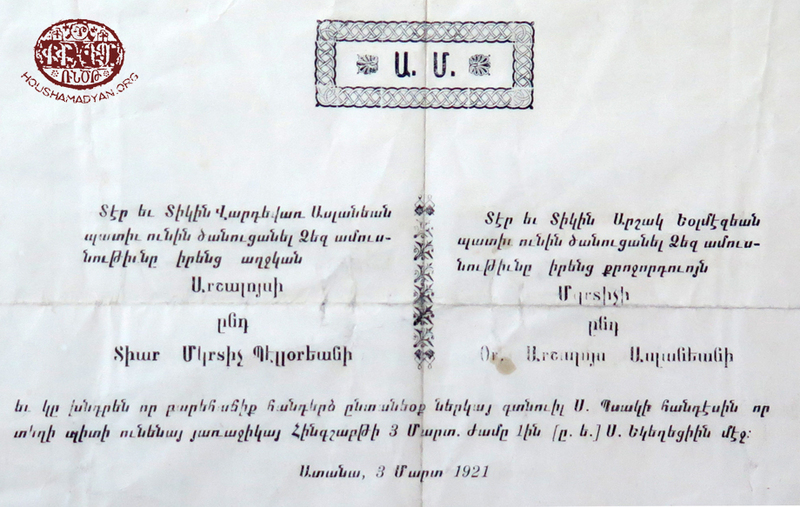 A letter in Armenian, addressed to Mariam Arslanian’s (born Sachian) address. 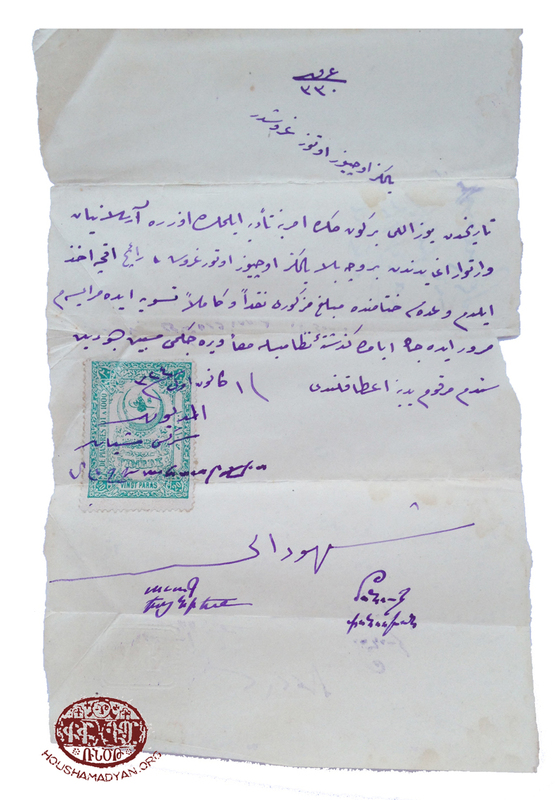 The letter was written by Harout (surname illegible) in 1920 and was sent from Hadjin. 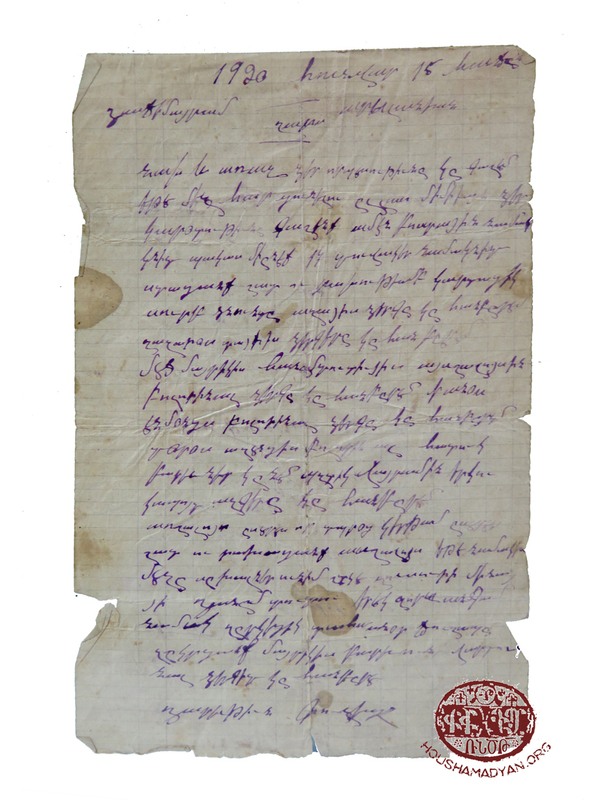 The letter was written during the post-Genocide period when, Armenians retuned to Cilicia, several survivors had also retuned to Hadjin. 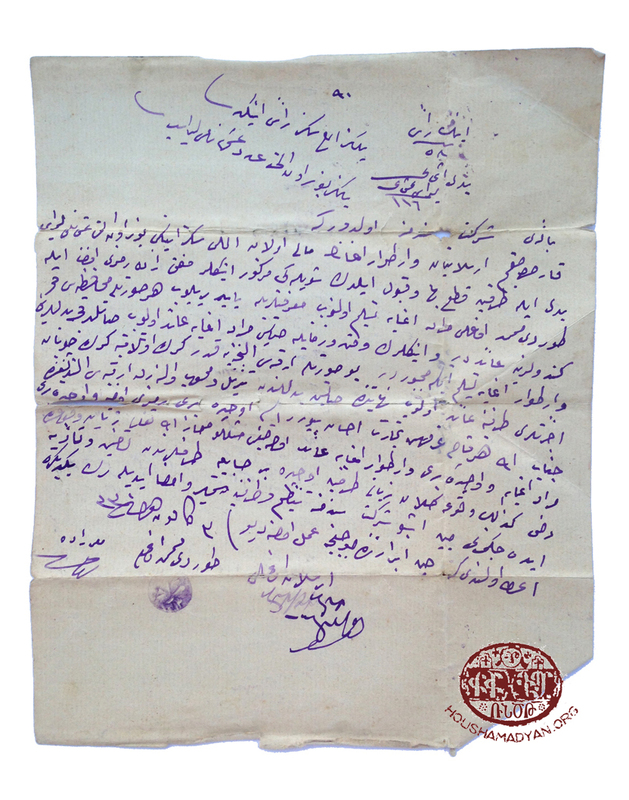 However the Arslanian family was probably in Adana during this period because they have received this letter there. 1. Arshag Piranian (holding the Istanbul-Armenian “Verchin Lour” [Latest news] newspaper) 2. Shahan Piranian 3. Shoushan Piranian 4. Alanig Piranian 5. Dorothy 6. Noune 7. Peprone 8. Mary. 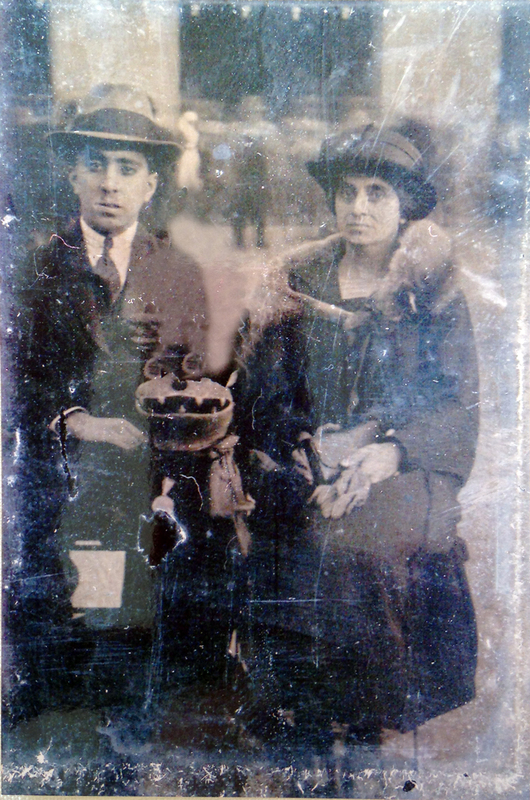 Vartan Piranian and his wife Nartouhi Piranian (born Der Mikayelian); they had two sons: Arshag and Shahan, and two daughters: Shoushan and Alan. 1. Arshag 2. Shahan 3. 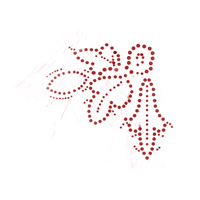 Nartouhi (their mother, born Der Mikayelian) 4. Alan 5. Shoushan. 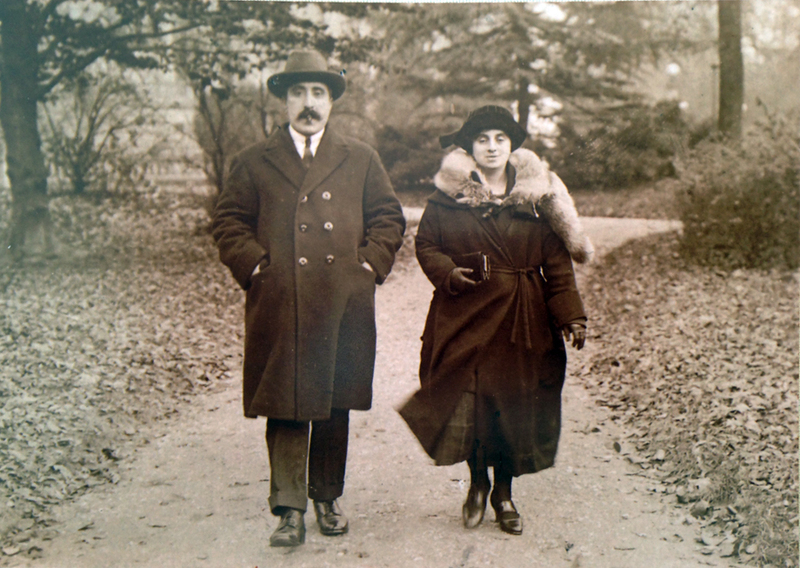 Vartan and Nartouhi Piranian, photographed in the German city of Baden-Baden, in 1923.